One of the most common questions that any palaeontologist gets asked in the field is "Is this a tooth", often by a small child, and it almost always turns out to be a pointed bit of flint, which is often disappointing for the child, and makes you feel like a big old meany! Dinosaur teeth come in a variety of forms, the three most common are listed below. Leaf-shaped teeth are usually owned by herbivorous dinosaurs, on the Isle of Wight these are Iguanodon, Hypsilophodon and Valdosaurus. They are also found in thyreophoran (armoured) dinosaurs such as Polacanthus. They can, however, be found in some carnivorous dinosaurs, such as troodontids. Blade-like teeth are found in the carnivorous dinosaurs, such as Neovenator. Nowever, not all theropods have laterally flattened teeth: Baryonyx has conical teeth, and Eotyrannus has teeth nearly D-shaped in cross section. What they do all have in common is a row of serrations along the length of the tooth. 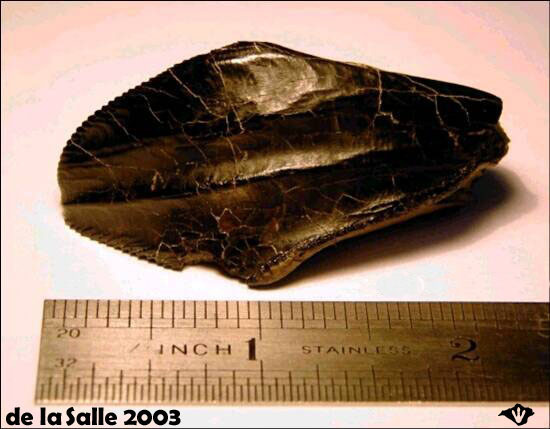 These are found in the sauropod dinosaurs, and are either straight or can even be similar to leaf-shaped teeth, but lack the serrations along the edges.